Before I Make Eye Contact, I Make Brow Contact. For men, facial hair is a rite of passage, a sign that a boy is growing up and becoming a man. For women, however, facial hair is far less desirable. Unfortunately, the human body sometimes forgets that women would prefer to have a smooth face, without the appearance of unwanted facial hair. When this happens, facial hair removal can be difficult, time consuming and, sometimes, unpleasant. One of the best ways to eliminate unwanted facial hair, for both men and women, is through waxing. One area where women often find unwanted hair is around the upper and lower lip. The waxing hair removal service at J. Faith Hair Studio can help remove the unwanted hair, leaving your lips soft, smooth and supple. It is a simple process using wax just slightly above skin temperature and one, painless pull. Tweezers may be used to remove stray hairs that aren’t removed with the wax, but that is not always necessary. Another area where women suffer from unwanted hair is on the chin, especially as they grow older. Removing chin hair can be very difficult. Waxing is highly recommended to remove those unsightly hairs as chin waxing can be performed in a matter of seconds. In addition, some women report that waxing actually causes chin hair to be much thinner when it returns while others say that it grows more slowly. There have even been reports of chin hairs that do not return at all after a waxing treatment. We offer full waxing services that’ll leave your skin feeling silky and smooth–and your results will last significantly longer than with shaving! Keeping your eyebrows shaped properly and avoiding the woolly caterpillar look can be time consuming, difficult and annoying. Plucking and trimming your eyebrows is tedious as well as painful. Instead of constant plucking with tweezers, consider the waxing hair removal service at J. Faith Hair Studio. Eyebrow waxing has come a long way over the years and the technicians at J. 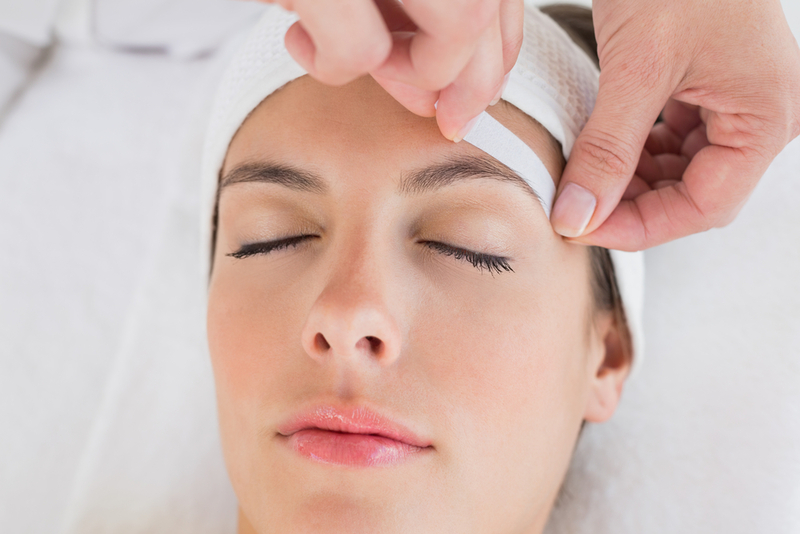 Faith are able to shape your eyebrows with wax with pinpoint precision. Waxing also lasts longer than plucking and there have been cases where waxing completely eliminated unwanted hairs in the eyebrows. For most women, cheek hair is fine and light so it is not obviously visible. However, some women suffer from cheek hair that is thicker and more visible. Even men sometimes need additional assistance removing unwanted cheek hair. It is important to understand that waxing to remove cheek hair must be handled by a trained professional as the cheeks are much more sensitive than other areas of the face. You could risk damage to your skin if waxing is not done properly. The technicians at J. Faith Hair Studio are trained in the safe removal of facial hair. Visit them for a no-obligation consultation to see if waxing is your best option for removing unwanted cheek hair. Is There A Salon Near Me That Offers Facial Hair Removal? If you have been asking “are waxing services near me able to help with my unwanted facial hair,” you need to contact J. Faith Hair Studio today to set up your no obligation consultation. The technicians can review your situation and suggest the best method for removing unwanted facial hair that will leave your skin feeling soft, smooth and free of hair. Visit them online or give them a call today to arrange for your initial appointment.